Art takes many forms around Wichita, but none give the city as urban of a feel as the many murals decorating downtown and the North End. From positive messages to civic pride, the vibrant paintings speak life into abandoned buildings and engage the community in an appreciation for art. Check out the photo gallery below where you can find some of the city’s most photogenic murals, many added during art festivals like Avenue Art Days in the Douglas Design District and Summer Mural Jam in the North End. "You Are What You Create"
"Moon Apples & Sun Apples"
Dozens of artists are responsible for the amazing artwork throughout the city. From art collectives to individual artists, each bring their own style and skills to the streets of Wichita. Learn more about several of Wichita’s talented artists and their work through the Avenue Art Days Mural Map app or through the Avenue Art Days website. 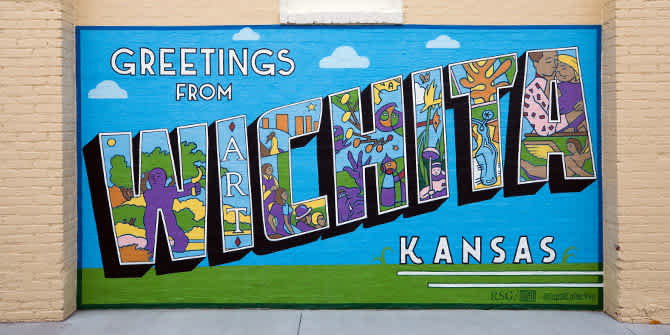 Looking to explore Wichita’s downtown murals with your own self-guided tour? Check out the map below. You can also see several murals on the north side of town including the largest mural in the world painted by a single artist near 21st and Broadway. See full map here. Wichita has other forms of urban art displayed throughout the city including bronze sculptures and the Keepers on Parade. See how many of each you can find while you’re in town!